Summary of today’s show: On our Thursday show, Scot Landry, Susan Abbott, Gregory Tracy, and Fr. Roger Landry consider the new headlines of the week, including the Supreme Court’s ruling on the Affordable Care Act; Cardinal Seán’s Fortnight for Freedom town hall; last Saturday’s ordination Mass; the Redemptoris Mater Seminary gala dinner honoring Rabbi David Rosen; the Catholic Appeal passing a milestone; and Catholic Press awards for the Pilot. It’s been a busy week between the ordinations, the Fortnight4Freedom live,interactive town hall, the Redmeptoris Mater Seminary. They brought in Gregory Tracy and Fr. Roger Landry, who has just completed his move to St. Bernadette Parish. Scot said the live town hall was the first of its kind to his memory. 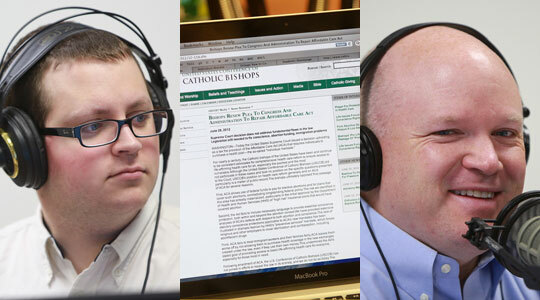 Susan said she was impressed by the production values as well as the guests, John Garvey, president of Catholic University of America; Kim Daniel of CatholicVoices USA; and Angela Franks of Theological Institute for the New Evangelization. Greg said he liked it very much especially toward the end with the question and answer period. He liked the give and take among the panelists. Scot said that for those who hadn’t been up to speed on these issues this town hall provided a lot of good background. Fr. Roger said he was also very impressed by the Q and A. He thought President Garvey looked like Christopher Plummer and speaks like a movie star. Angela Franks was incredibly powerful on how this isn’t a war on women. Fr. Roger also thinks this is the kind of thing we should do more often, not just when we’re in crisis. It’s a great opportunity to learn a lot in one hour. Scot said Cardinal Seán very much liked it too and he thinks the cardinal would like to do similar things on other issues, like the Year of Faith this fall on what it’s about and what he’s asking Catholics in the Archdiocese to do. “You may have heard some in the secular media advance certain myths about the HHS mandate, which is the latest infringement on our religious liberty. For example, you might have heard that this issue is about access to contraception, or that this is just a Catholic issue, or that the Church is imposing her values on the rest of society. You might have heard that the Church is waging a war on women,” she said. “All are false, blatantly false. Clearly this issue cannot be about access to contraception, which is inexpensive and broadly available. If a person can afford a cell phone or even three lattes a month, she can quite likely afford to pay for contraception. Instead this issue is about forcing Church organizations and every Catholic to provide contraception and abortion-causing drugs and subsidize them, which are actions against public teaching,” she said. Susan said the comparison to phones and coffee grounds it in reality. Angela was succinct and refuted the major points we keep hearing in the popular press one by one. Susan also liked Angela’s comment that it’s up to the laity to take the lead on the front lines at the water cooler. “The framers of our constitution and the Bill of Rights protected the free exercise of religion because they thought it was important for human flourishing and happiness, but our society will not care about protecting religious freedom for long if it doesn’t care about God. That is where we must begin to reform. We won’t have and we probably won’t need religious exemptions for nurses, doctors, teachers, social workers, if no one is practicing their religion. The best way to protect religious freedom might be to remind people that they should love God,” Garvey said. Scot said when we look at the Church as a family, many of our family members have stopped practicing their faith and we have to look in the mirror and see if we are still practicing our faith as strongly. If we don’t care about our faith, then why should it be protected? Greg said the ambivalence of some Catholics was one of the arguments used against our religious liberty. Fr. Roger said the point illustrates how we got here. As for the how to move in the future, we have to grow in the importance of religion not just to society, but to each of us individually as well, which is why the Year of Faith is so important. Moving to other news, the ordination Mass took place at Holy Cross Cathedral last Saturday. The new priests are Fathers Eric M. Bennett, 31; Eric F. Cadin, 31; Felipe de Jesus Gonzalez, 34; John J. Healey, 62; Adrian A. Milik, 30; and Michael F. Sheehan FPO, 31. Father Michael Sheehan, a member of the Franciscans of the Primitive Observance, a religious community in the archdiocese, described the feeling of finally becoming a priest after completing his studies. “It is awesome. It is awesome in all of the senses of that word. On the one hand, there is the joyful thrill of knowing that you will be acting as Christ for people, and then on the other hand, there is the chilling responsibility that you will be acting as Christ for people,” he said. Father Sheehan’s parents said their son felt the call to the priesthood from an early age. “I am extremely proud of Michael and all his accomplishments. It all culminates today in his ordination. We are very pleased and excited for him,” the new priest’s father Gary Sheehan, 59, said. His mother Diane Sheehan, 57, said she knew her son would find success in his pursuits. “Michael has been a leader his whole life. We knew in second grade that he was going to do well whatever he did. God bless him. It has been a long time coming to this day,” she said. His grandmother, Anne P. Shannon, 83, said she knew her grandson had a calling since he was young. “I was attending the quarter of seven Mass every morning. He was with me, so I always knew that Michael was special, and that he indeed had a calling — and I was right,” she said. Scot said the ordination is the highlight for all the families, not just the new priests. Susan said she didn’t attend the Mass, but watched it on TV and found herself compelled to watch the whole thing. She said she took notes on Cardinal Seán’s homily in which he talked about St. Peter’s denial, which he said wasn’t made to a soldier with a knife, but to a waitress with an attitude. She talked about the images of the imposition of hands and how the CatholicTV coverage allowed for the sacred silence that occurred at several times during the Mass. Fr. Roger said the words of the sacrament are a continuing call to conversion 13 years after his own ordination. He looks at his hands differently now because of the sacraments he now performs with them. His hands are an extension of his body as he is an extension of Christ’s Body. Fr. Roger talked about how as a priest he is now on call 24/7. He recalled a conversation with actor Jim Caviezel who played Jesus in the Passion of the Christ about the pressure that’s on him all the time now to live up to that image and how he wondered how priests lived up to that their whole lives. Greg said he thought how fortunate he’s been able to go to the last 10 out of 11 ordination Masses. What he recalls is the sense of emotion among the ordinands both before and after the Mass. One of his favorite moments was when the Cardinal blesses the hands of the new priests and then kisses them. The six men are starting their new assignments today. Breaking news this morning is that Archbishop Fulton Sheen has been declared Venerable, which is the second big step toward canonization. Fr. Roger said when he was in the diocese of Peoria, he’d heard about a miracle attributed to Sheen, which could advance him to the next step of beatification. He also called attention to the cause of Servant of God Alvaro del Portillo y Diez de Sollano, who was also declared Venerable, and was a major contributor to Vatican II as well as a close collaborator with Pope John Paul II. Archdiocese of Boston 2012 Ordination to the Priesthood – Cardinal Seán O’Malley OFM Cap from Archdiocese of Boston on Vimeo. Also in the Pilot this week is a story about the Redemptoris Mater Seminary gala dinner last Sunday. Susan said her first close-up experience of the NeoCatechumenal Way and the seminary was the big concert this past May at Symphony Hall and so she wanted to come to this dinner. She said it was a great dinner, honoring Rabbi David Rosen, the International Director of Interreligious Affairs of the American Jewish Committee and Director of its Heilbrunn Institute for International Interreligious Understanding. He is also the former Chief Rabbi of Ireland. He is a past chairman of the International Jewish Committee on Interreligious Consultations and is also Honorary Advisor on Interfaith Relations to the Chief Rabbinate of Israel. He serves on its Commission for Interreligious Dialogue, and represents the Chief Rabbinate on the Council of Religious Institutions of the Holy Land. Susan said he spoke about the struggle of the Jewish people for survival as well as the teaching of the Church in the Second Vatican Council on our Jewish elder brothers in faith. He also spoke about Pope John Paul II’s friendship with the Jewish people. The archdiocesan liaison to the Jewish community, Father David C. Michael gave his thoughts on the speaker and the meaning of the night for Catholic and Jewish communities in Boston. “Reaching out in love and understanding to one another, that is an important place to begin. Then we have to deepen that relationship, that’s where the hard work begins. The hard work begins in the deepening,” he said. “I think that his quote of John Paul II was absolutely on target where the pope says before we can be a blessing to the nations we have to be a blessing to one another,” Father Michael said. Greg said Rosen is very significant in terms of Catholic-Jewish relations. When the Holy Father calls inter-religious meetings, it’s Rosen who is called to stand next to the Pope as a representative of the Jewish faith. The audio of Rosen’s speech will be on the Pilot’s website on Friday. Scot said June 30 is a milestone date for the Catholic Appeal, because it’s the end of the fiscal year and the end of the parish campaign. Scot said they are within $100,000 of making their fiscal year goal of $14 million but still have a long way to go to make the calendar year goal of $14 million in 2012. Scot also noted that the Pilot won seven Catholic Press Awards among 64 total awards given. Greg won an award for a photo he took to illustrate a story on the new Roman Missal. They also won an award for their editorial on the Maria Talks website as well as another on the Defense of Marriage Act. The Anchor also won an award for the columns written by Fr. Timothy Goldrick. The award was given by the Society for the Propagation for the Faith. Scot also profiled the obituary of Fr. Joseph Moynihan who was a pastor for 22 years in Westwood. Third, ACA fails to treat immigrant workers and their families fairly. ACA leaves them worse off by not allowing them to purchase health coverage in the new exchanges created under the law, even if they use their own money.This undermines the Act’s stated goal of promoting access to basic life-affirming health care for everyone, especially for those most in need. Scot said it seems a measured statement. If the whole act had been struck down, the 50-plus lawsuits filed against the HHS mandate wouldn’t have been needed, but today we’re in the same position we were in yesterday. Greg noted that the justices in the minority would have struck down the whole law. He said the bishops were always in favor of expanding healthcare for the poor, just in a way that doesn’t violate consciences. Scot said these lawsuits filed Catholic institutions continue and it is another constitutional issue about religious liberty. Today’s decision was on the government’s authority to enact an individual mandate. Scot said his analysis is that this clearly expands federal power, even if it’s a tax on those who won’t buy federal healthcare. Roberts said you can’t force someone to buy healthcare, but you can tax someone for almost anything. Greg said Roberts also said he wasn’t saying that this tax is a good idea. He’s essentially saying that we need to respect the will of the people through their elected officials in passing a law if it’s constitutional. It may not be a good law, but it’s constitutional. It also means it can be repealed by the representatives as well. Scot said this is the second biggest court decision in his lifetime, second only to Bush v. Gore. Greg noted that this is different from Roe v. Wade when it invented something that didn’t exist before. In this case, the court was only giving deference was being given to the elected representatives.